TUCSON, Jan. 28, 2019 /Christian Newswire/ -- Life Legal Executive Director and attorney Alexandra Snyder and Bobby Schindler, Founder of the Terri Schiavo Life and Hope Network met with hospital administrators in Tucson, Arizona this morning regarding a young man who has been denied nutrition and hydration. Regardless of David's prognosis, food and water—as Pope John Paul II has said—"always represents a natural means of preserving life, not a medical act." Providing nutrition and hydration is "ordinary and proportionate, and as such morally obligatory." 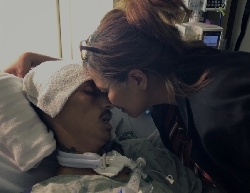 David's mother, Patricia Adames, has fought tirelessly for her son. She had planned to transfer David to a facility that can provide long-term care. However, after weeks without nutrition and adequate hydration, David became emaciated and too fragile to be transferred. During today's meeting, the hospital agreed to reinstate David's food and fluids. The hospital has also agreed to assist with his transfer from St. Joseph's to suitable a long-term care facility. "We are pleased that St. Joseph's hospital has agreed to resume providing David with food and water," said Life and Hope Network Founder Bobby Schindler. "We will continue to advocate for David until we can find a facility that will provide for appropriate, long-term care." "Life Legal is thrilled with today's developments. It is unacceptable for a patient to be denied the basic rights of food and water," said Life Legal Executive Director Alexandra Snyder. "We are grateful that the hospital has agreed to resume ordinary care for David." Reinstatement of David's nutrition and hydration was confirmed earlier this afternoon.